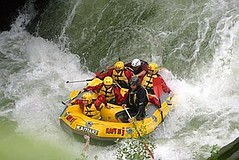 During Jaap's "Last Supper" a few hours ago, I remembered my rafting trip with him in New Zealand. I only reflected on it again because he's having some problems getting photos from an old travel-mate of his. I suddenly realized that I'd never really posted my rafting photos from the Kaikura in Rotorua. In fact, I totally called it when I posted them on Ofoto that it would take me at least a year to get them up on my site. Well, it's been two. And they're not on my site, they're on Flikr. They're low-res, so even those on lite-speed internet access will have no problem viewing them. At least now I can post some damn photos in my New Zealand travel section. PS: thanks to Jaap for inspiring me to do this update.